Lemongrass adds a distinctive, pleasant citrus aroma to a wide range of Thai food, including tom yum soup, curry paste, and assorted meat dishes such as lemongrass chicken. Lemongrass adds a wonderful flavor, but a key point of using it in Thai food is for the aroma--to add the sensation of the scent, or to mask any undesirable odors of beef, poulty or fish. Lemongrass is also known throughout the world for it's medicinal effects, including general pain relief, reducing blood pressure, reducing intestinal gas, helping to improve the appetite, it detoxifies vital organs, and is known to reduce cholesterol, excess fats and other toxins. Lemongrass stimulates digestion, blood circulation, and lactation. Lemongrass tea, shown below, is very simple to make and is known as a natural remedy for depression, and jet lag. Lemongrass is a rhizome that comes from an underground root system, similar to bamboo. 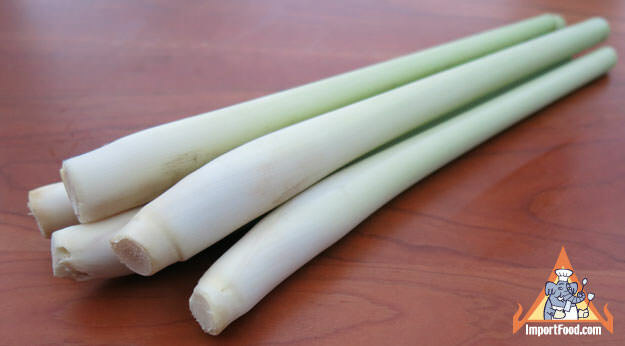 Good quality lemongrass has a nice thick stalk, and it keeps for weeks in the fridge. For long-term storage, cut into 2 or 3 inch pieces (see below, how to prepare lemongrass), and freeze in a ziplock bag. We ship fresh USA-grown lemongrass via Priority Mail, quick delivery within 2-3 days straight to your mailbox. They are packaged well and should be refrigerated promptly. Please Note: if you order only fresh produce, select "$0.00" as shipping charge at checkout (because the prices below include shipping). Occasional delays due to Mother Nature & harvest conditions. Call 888-618-8424 if you need a definite delivery date. If you order Thai lemongrass and any other non-fresh items, you must checkout with "Fedex Ground" as the shipping method, and you will receive the other items separately. We also offer a Fresh Thai Produce Kit. We offer dried lemongrass, and lemongrass powder too. You use only the inner white portions of the stalk, so remove the tough outer layers first. Step 1: using a knife, cut one inch from the root end of the stalk. Step 2: peel away and discard the tough, grassy outer layers. Step 3: with a good cleaver, whack the lemongrass firmly several times to bruise it, this releases the oils. Step 4: cut into two or three inch pieces, or mince if your recipe calls for it. We love fresh lemongrass simply steeped in water, served as a natural tea. In 2006 researchers at Ben Gurion University in Israel discovered that the lemon aroma in lemongrass kills cancer cells while leaving healthy cells unharmed. The findings were published in the scientific journal Planta Medica, which highlights research on alternative and herbal remedies. The best reported way to consume it for the purpose of staying healthy? Lemongrass tea. It couldn't be easier!